With only 1 week to go my thoughts are turning to things I look forward to most when going to France and Salad De Chevre Chaud is in my top 10 list of favourites. Salad De Chevre Chaud translates to hot goats cheese salad and on the face of it a bit of hot cheese on lettuce does not sound very exciting but this is France and their culinary skills are anything but dull. 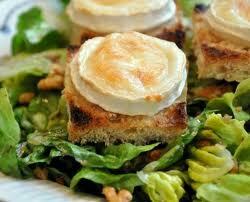 This dish can be found on many restaurant menus either as a first course or as the main event, recipes vary from region to region and indeed from restaurant to restaurant, some add walnuts, cooked meats or lardons but 4 main ingredients remain the same: goats cheese, lettuce,toast and a dressing. The dressing is usually a mustard or peppery dressing that cuts into the saltness of the cheese with the lettuce adding a final cooling balance. Greg Wallace and John Torode (Masterchef presenters) would decribe it so much better than I can – all I can come up with is it’s to die for, I could live my life on a diet of Salad De Chevre Chaud every day and for me, as a vegetarian in France (many French people find vegetarianism incomprehensible and this is reflected in their restaurant menus) it is a godsend. This entry was posted in Cuisine, Eating Out, France, Recipes and tagged dressing, French cuisine, goats cheese, Greg Wallace, John Torode, mustard, peppers, restaurant, salad de chevre chaud. Bookmark the permalink.